Ensure business continuity and the ultimate security for all of your software and client data with Digita Virtual Office, our hosted solution for accountancy practices. 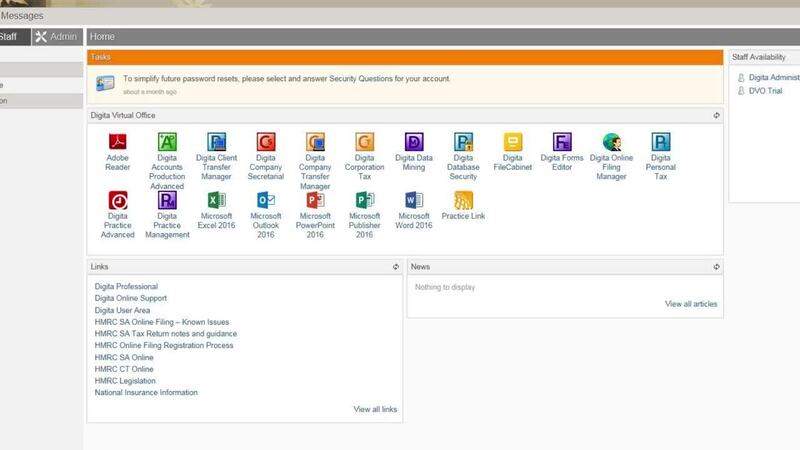 Maximise your staff and resources with 24/7 access to your Thomson Reuters software and email inbox, along with the complete Microsoft office suite of applications included as standard. Work in an online environment from any location with an internet connection. 24/7 online access to all of your Thomson Reuters software and email inbox. Keep in touch with staff and clients and control who sees what with user defined settings. Brand your online office with customisable design functionality. Why use an online virtual office? Work remotely from client offices, home, or anywhere with Internet. Check in on the go with access to your work email from your laptop and phone. Offer staff flexible working arrangements and cast a wider net for recruitment. Comply with recordkeeping requirements with automated tools. Ensure business continuity, even in a major incident such as a fire or theft. Get an extra layer of security with our state-of-the-art UK data centre. Soaring Falcon Accountancy is an award-winning practice working completely in the cloud, which has changed the way they do business. Alex uses Digita Virtual Office to stay in touch with her staff and clients 24/7. "The Cloud is helping me to attract the next generation of young entrepreneurs." Using Digita Virtual Office, you can gain access to our full suite of tax and accounting solutions. Grow your practice and better service your clients. Hosting is the easiest, lowest maintenance and most secure way to run the Digita Professional Suite and can help alleviate many of the issues related to GDPR compliance.